Back in my uni days, weekends were a time for me to get in some more hours of work to earn some money- at one time I was working three jobs, one on the weekdays, one at nights and one on the weekends. When I first started working full time I did try to keep the busy weekends going, making sure I filled my weekends with plenty of activities but much has changed since then, and even though it has only been less than two years since I finished uni, I honestly do not know how I did it! Although I do try to fit in some baking and blogging sometimes, ask me what I’m doing on the weekends now and I’ll probably tell you that I’ll be ‘chilling’. At home that is. In my pyjamas, watching tv etc etc. And lazy as it may sound, it’s what keeps me happy and as a bonus, it’s quality family time as well. Not to say I do absolutely nothing. ome weekends I’ll be motivated enough to spend a day making cute bentos for lunch, but you’ll more likely find me whipping up a quick soup, my go-to option for work lunches. It’s an easy way to get in a number of veggie serves and there’s nothing simpler than boiling up veggies in stock, placing it in my thermal cooker for a couple of hours and then blitzing it in the blender to make a week’s worth of lunch (plus extras to go in the freezer!). This chickpea and cauliflower soup is the newest addition to my soup repertoire and one I’m quite excited to share with you. The recipe itself comes from the Monday Morning Cooking Club: It’s always about the food book which I was lucky enough to receive a copy of a couple of months ago. The chickpeas were my addition, and the original recipe was served with pangrattato (Italian bread crumbs)- I served mine with toasted rustic white bread as it saves a step, and it feels a little more substantial than crumbs. 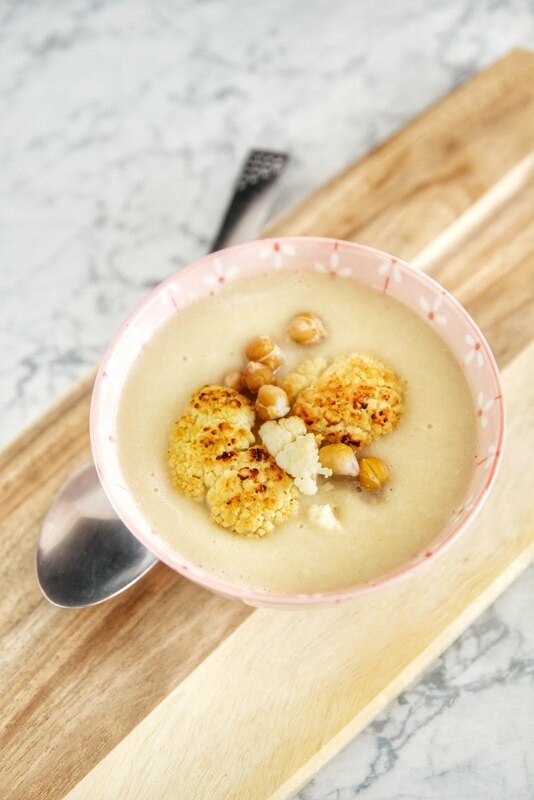 It’s the first time I’ve tried cauliflower soup and if you haven’t tried it either, you must give this recipe a go- it is super smooth and creamy, and I loved it so much I made it twice within a month! In a stockpot, melt the butter with the olive oil over medium heat, then saute the onion about 15 min or until it starts to brown. Add the garlic and coriander, and stir for another minute. To make the roasted cauliflower and chickpeas, preheat the oven to 180 degC. 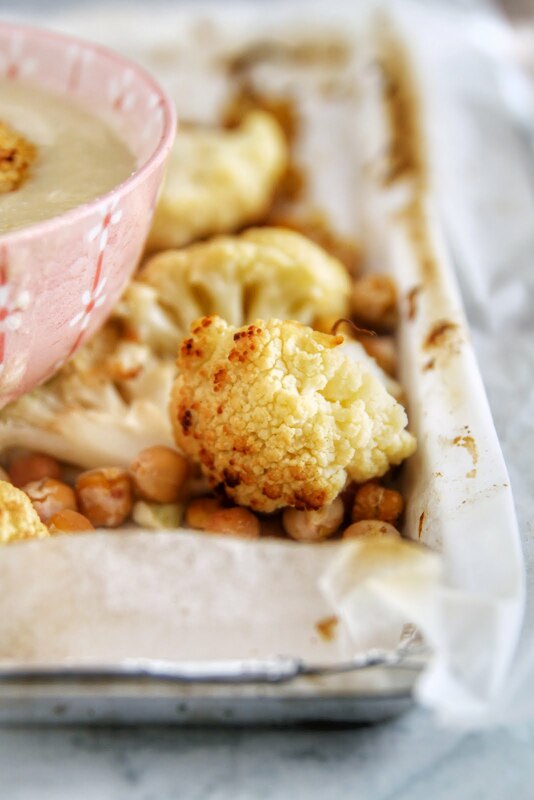 Place the cauliflower florets and chickpeas on a baking tray and drizzle with the olive oil. Sprinkle the salt and thyme and toss to coat. Bake for 30 min of until crisp around the edges and golden. 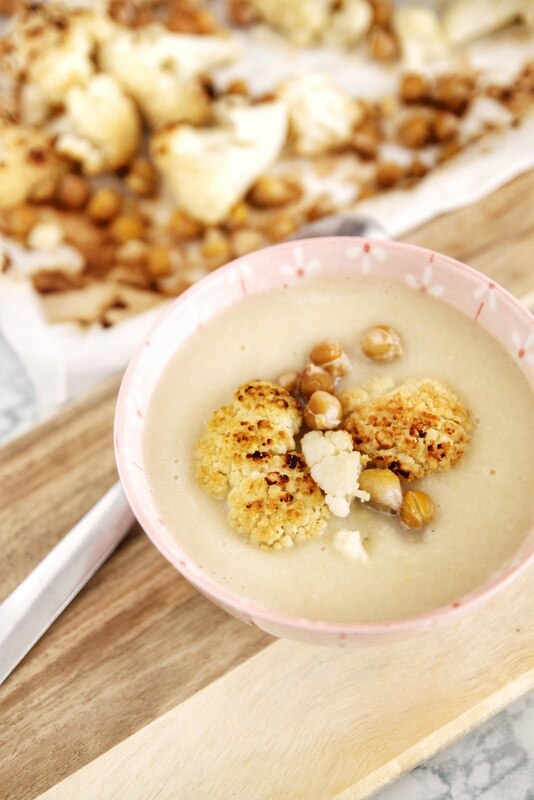 Serve the soup topped with the roasted cauliflower florets and a spoonful of greek yoghurt.